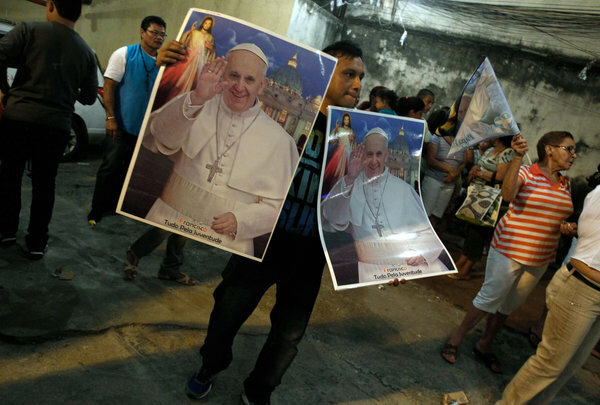 A man sold posters of Pope Francis on Thursday in Rocinha, a large slum of Rio de Janeiro. RIO DE JANEIRO — A month ago, hundreds of thousands of young people took to the streets of Brazil to protest corruption, wasteful government spending, bad schools and hospitals, police brutality, and other abuses of power. On Monday, Pope Francis, in his first venture abroad, will dive into the middle of that ferment when he begins a weeklong visit to the world’s largest Roman Catholic country. Francis has endorsed the protests in general terms, and, according to European news reports, will do so again more emphatically and specifically this week. Church officials here declined to confirm those reports, but they said that two Brazilian cardinals, Cláudio Hummes and Raymundo Damasceno Assis, have been working closely with the Vatican to assure that Francis’ declarations on social justice here will convey sympathy both for the protest demands and those involved in the movement. The trip, whose nominal purpose is to have the pope meet with and speak to participants at the World Youth Day, a conference of Catholic youth here, was originally planned for Benedict XVI, Francis’ predecessor. Initially there was speculation that the new pope might cancel because of the scandals he is confronting at the Vatican. But the Argentine-born Francis seems to see a visit here as a way to direct attention on the gospel of social justice that he has said he wants to make the focus of his papacy. Previous papal visits, by Pope John Paul II and Benedict, were marked by doctrinal disputes and veiled verbal skirmishes between advocates of the theology of liberation, which mixes the gospel and political activism on behalf of the poor and persecuted, and the Vatican hierarchy, which sees the movement as tainted by Marxism. As archbishop of Buenos Aires, Francis never showed much sympathy for liberation theology, but since he assumed the papacy, signs abound that a truce is now in effect, at least temporarily. Barely a month after becoming pope, Francis took a symbolically important step that liberation theologians here and elsewhere in Latin America interpreted as a peace offering. The beatification of Bishop Óscar Romero, a Salvadoran who was killed by a right-wing death squad in 1980 and is considered a martyr by many disciples of liberation theology, had been frozen since 2005, the year Benedict assumed the papacy, but Francis almost immediately ordered it reopened. Liberation theologians often critical of Vatican policies have responded in kind, led by Leonardo Boff, a former Franciscan priest who in 1985 was ordered not to write or speak publicly for a year because of his positions by the Congregation for the Doctrine of the Faith, headed at the time by Cardinal Joseph Ratzinger, the future Benedict. Now an emeritus professor of the philosophy of religion at the state university here in Rio, Mr. Boff just last week published a laudatory biography of the pope. One of the principal complaints of the protests that have swept Brazil is excessive official spending in the face of pressing social needs, mainly the billions being spent on sporting events — but the $52 million the government is contributing to the youth conference and papal visit has also been sucked into the fray. Cardinal Scherer defended the expenditure, which accounts for about a third of the visit’s total cost, as good for Brazil. At Francis’ request, the original itinerary prepared for Benedict has been expanded to include a visit to Aparecida, site of Brazil’s biggest shrine to the Virgin Mary. It was also there, during a visit by Benedict in 2007, that Francis, then Cardinal Jorge Mario Bergoglio, scored a personal triumph by presiding over the writing of an important policy document that was presented to the pope on behalf of the Latin American Episcopal Conference. The document emphasized social justice and evangelization, an issue that remains critical to the Brazilian church, even more than in the rest of Latin America. When John Paul made the first visit by a pope to Brazil, in 1980, nearly 90 percent of the population considered itself Catholic; by the 2010 census, that had fallen to under two-thirds, with the number of Brazilians calling themselves Protestants rising to 22 percent from 6 percent during the same period. The situation here in Rio underscores the growing challenge to the Catholic church. According to census data, the growth of evangelical Protestantism, secularism and African-Brazilian faiths like candomblé has been so pronounced that Catholics no longer constitute a majority of the population in Rio de Janeiro State.